Available from: Book Depository, Waterstones, Blackwells, Walmart and many other good bookshops worldwide. A Hardback version of the 3rd edition of the book is widely available from Amazon in Australia, Canada, China, France, Germany, India, Italy, Japan, Spain, United Kingdom and United States (in English only). A Kindle version of the 3rd edition of the book is available from Amazon in Australia, Brazil, Canada, France, Germany, India, Italy, Japan, Mexico, Netherlands, Spain, United Kingdom and United States (in English only). A Google ebook version of the 3rd edition of the book is available from Google Books (in English only). Many Libraries now hold a copy so ask your local library if they have a copy to borrow. Various reviews for the book are shown on this web site and elsewhere. Sample pages from the book are viewable on Google Books, as well as Amazon uk & com and a pdf sample is also available. Published by Oneoff Publishing.com, Great Britain. The dinosaurs have been a source of wonder and fascination since they were first discovered. A large part of this fascination is their gigantic size, since they were the largest land animals to ever live, with even the smaller dinosaurs dwarfing the largest land animals of today. Although the gigantic size of the dinosaurs is obvious, the reason has remained a mystery for over a century. Why were the dinosaurs so large? 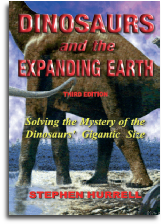 I was particularly interested in calculations which showed that the bones of the larger dinosaurs were too weak to support their own body weight. Here was the essential paradox of the dinosaurs' large size. Their bones should buckle and crack. Yet the fossil bones in museums around the world showed that these giants had thrived in their own world of hundreds of millions of years ago. How can both of these statements be true? There is one simple, yet astonishing, answer. The size of all life is controlled by gravity. A stronger gravity would tend to reduce the size of life whilst a weaker gravity would allow life to become larger. Dinosaurs may have become so huge because the earth's surface gravity was weaker on a Reduced Gravity Earth. The explanation is beautifully simple in its clarification of the dinosaurs' gigantic size. Using the concept of an increasing gravity allows a fascinating new world in which the gigantic animals of the past were forced to develop smaller sizes as gravity increased to the present day value. Could gravity have been less in the past? My book is a first attempt to explore the possibility.